A POLL for El Mundo reveals the PSOE are set for heavy general election losses in its traditional Andalucia heartland. The ruling PP are set to to cede ground to Ciudadanos in the symbolic Madrid and Valencia regions when the country goes to the polls on 20 December, according to the Sigma Dos poll. Meanwhile, a poll by A+M for 20 Minutos/Grupo Heraldo shows Ciudadanos and the PSOE polling roughly 21% each. If the El Mundo poll is correct, the PSOE’s share of the vote in Andalucia would fall from 36.6% in 2011 to 28% this time. That would represent the Socialists’ worst showing in the region since democracy returned to Spain in 1977. 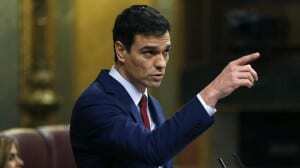 The PP would see their number of seats in the Spanish capital fall to 11 or 12, with Ciudadanos picking up between eight and nine. The poll shows the PP’s number of seats in Valencia could slip from 20 to between 10 and 12. In the A+M poll for 20 Minutos/Grupo Heraldo, Ciudadanos polled 21.01%, which would win them between 70 and 72 seats. The PSOE polled 21.03%, which would give them between 78 and 82 seats. Previous articleJerez Zoo: Why do visitors behave like animals? Both the PP and PSOE have treated Spain’s people with contempt over decades – both are corrupt to the core. One can only hope that things will change, but don’t bank on it. PSOE losing ground in Andalucia is music to my ears. What a pity so much damage has been done and it has has taken them so long. my thoughts exactly – vamos a ver.